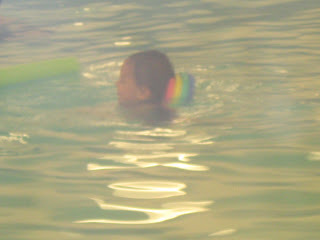 Andrew and Aaron have been going to swimming for several months. They love it. This month Andrew moved up to the preschool class. This is without mommy. 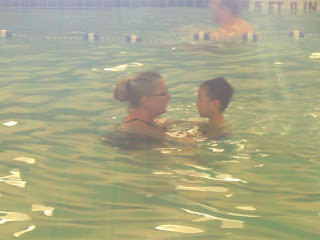 This is Andrew with his teacher. He has learned to reach and pull and kick. Of course his favorite thing to do is jump in. 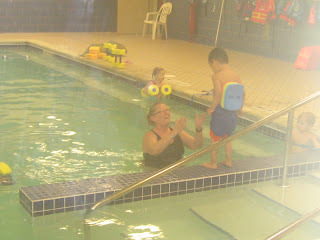 That funny thing on his back is called a power pak and it helps him float as he learns to swim. This is Aaron and he is our little fish. As you can see he doesn't need to have mommy to get around. He to gets around with a power pak.